What's new with the Small Fruits and Vegetable Gardens located at the University of Illinois Extension office located at 700 S. Airport Drive in Springfield? The asparagus has been harvested for several weeks. Soon it will be time to let the plants rest for the season. For more information on growing and harvesting Asparagus, https://extension.illinois.edu/veggies/asparagus.cfm . 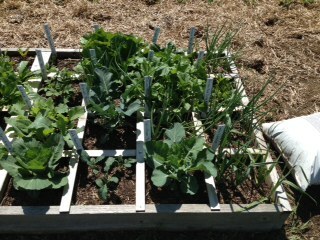 The raised vegetable garden bed is growing strong and looks great. Lots of good veggies in there; onions, various lettuce varieties, and kale to name a few. Really showcases what you can do with a little garden space and some creativity. Stop by to take a look for yourself. 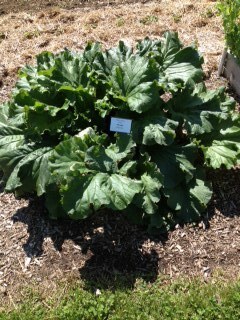 Also ready for harvesting is the Rhubarb. Rhubarb is a perennial vegetable that grows well in most of the United States. It is great used in pies, tarts, crisps, and sauces. Plant at one end of your garden where it will not be disturbed since it may be productive for five years or more. Remember, do not consume the leaves as they contain high amounts of oxalic acid, a toxic and potentially deadly poison. Read more about Rhubarb at https://extension.illinois.edu/veggies/rhubarb.cfm and then find a spot in your yard for this great plant. The garden is open from sunrise to sunset.